http://indinconsumercomplaints.890m.com/ is a fake complaint site, hosted for FREE 😐 on www.000webhost.com , a free web-hosting platform. In this half-built blog, supposedly meant to be a consumer complaint platform, we did not find any complaint form, or method using which one can submit a complaint. It’s just a wordpress installation with 30 odd complaints. Most of them, if not all, are meant to be used in some form of a DMCA abuse. 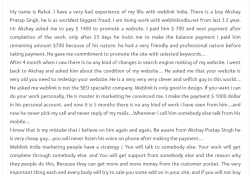 Here’s a good example – http://indinconsumercomplaints.890m.com/fraud/brain-work-fraud/ . If you see the comments, both the users ‘Johan‘ and ‘marksmith‘ are listed as post authors. Either the author seriously suffers from a split personality (3 way split nevertheless), or this is getting too lame and obvious for us to investigate anymore. Searching for ‘site:http://indinconsumercomplaints.890m.com‘ on Google delivers only 65 results. 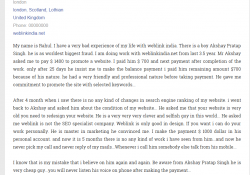 According to 000webhost.com, this free blog was created on 16th Jan 2016. Most, if not all the articles on it have been deliberately back-dated to mislead Google and everyone else. 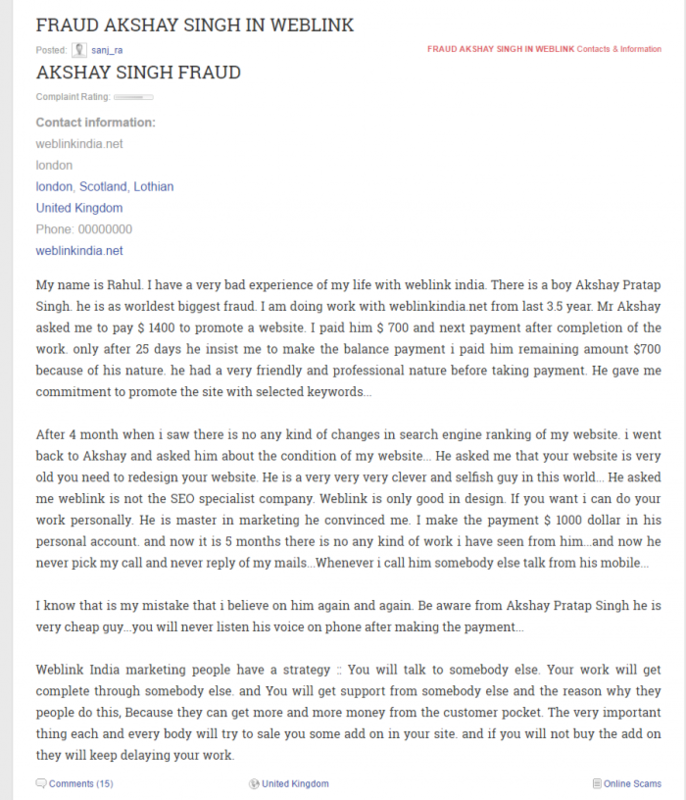 A random consumer complaint, which might have been hurting Mr Akshay Singh or his firm ‘Weblink India.Net Pvt. Ltd’s reputation online. Instead of addressing the issue, they thought a fake DMCA would hide the negative content on Google. The original complaint spoke of how this individual and his firm provided inadequate service to a client, and their unethical business practices. Well, with this fake DMCA, they certainly proved us wrong (plz detect sarcasm here)…. 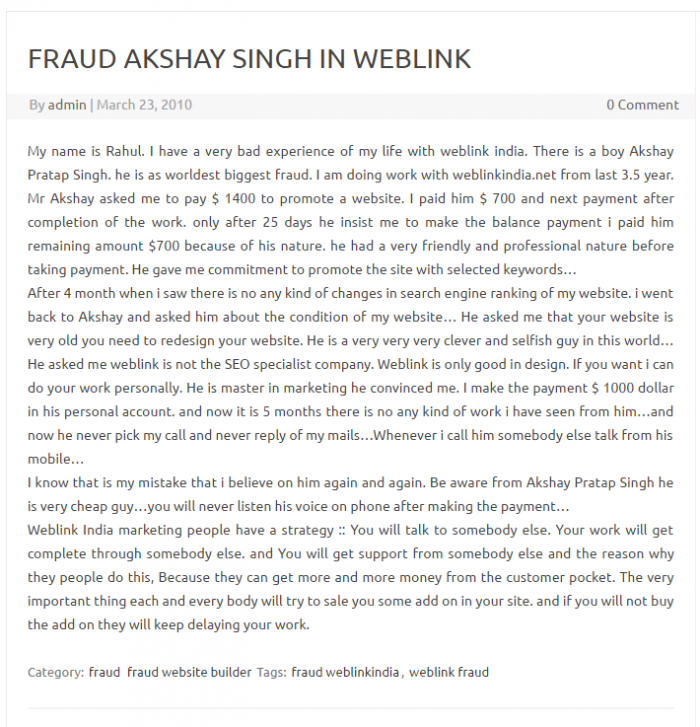 EDITOR’S COMMENT : For those who might ask – ‘why and how do we interject that ‘Akshay Singh of WebLink India Pvt ltd’ has something to do with this fake DMCA. Couldn’t it be a coincidence ?’, we will say this – When someone goes and creates a whole new fake news site, falsifies his/her identity and submits fake DMCA to try and de-list some very targeted content on Google, it signals intent and a plan. It is obvious that ‘Akshay’ or ‘WebLinkIndia’ someone they hired was directly involved in this crime. They also cannot plead ignorance in this matter, since this notice on Google search is hard to miss, really.